My goals in working with her are to (1) expand her vocabulary (2) increase her speech from one or two word answers to full sentences (3) improve her phonemic awareness (4) increase her understanding of concepts (i.e. opposites, positional words). Initially our sessions included (1) a wordless picture book (2) nine words that are related to a theme (i.e. Bedtime) (3) a rebus poem / chant ( i.e. Twinkle Twinkle Little Star). Birthdays, In the Neighbourhood, Valentine’s Day, Feelings, Weather, Clothing, Families, Farm, Bedtime, Music, Fruits and Vegetables, Colours, In the Kitchen, in the Bathroom, Toys and Counting. 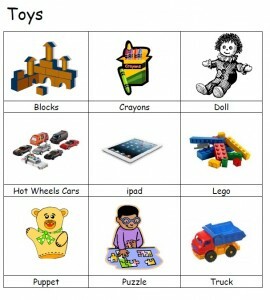 All of the themes are intended to introduce new and reinforce her existing vocabulary. Once the individual words are mastered, we add description: blue umbrella, brown blocks, green grass. More recently, we have added concepts to our sessions: Words that Are Opposites, Positional Words (in, beside, under, over, behind, in front of). Chatting about a simple Wordless Picture Book. Breakfast with Jack created by Pat Schories has been a favourite. Reviewing the vocabulary introduced in previous sessions. My young student proudly gives herself a “check” each time she correctly says a word. Reviewing the rhymes and chants introduced in previous sessions. 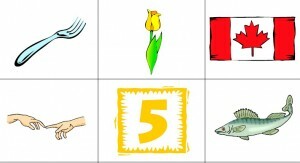 She tracks across each line, using rebus picture clues to ‘remember’ the words. She loves to ‘read’ Twinkle Twinkle Little Star and Grandma’s Glasses all by herself. Sorting pictures into words that begin with the /F/ sound, the /M/ sound, the /C/ sound and the /S/ sound. I mix picture cards for two sounds, she sorts them and then we mix up two more sounds. To further encourage speech, we play with puppets and we play Simon Says and we sing If You’re Happy and You Know It. My student loves to be Simon. She giggles and laughs as she tells me what to do. I can’t tell you how rewarding it has been to work with this young girl. Her vocabulary and her ability to converse has blossomed. It has been so exciting to witness the transformation in this beautiful, funny, enthusiastic child. For the past six weeks, I have been working with a four year old girl who is learning English as a second language and who has a speech delay. We meet once each week for one hour. I have been using a variety of materials and techniques to support her learning. Today I thought I would highight a few of them. During each of our sessions, we read one or two wordless picture books. These are books that have little or no text. Readers use picture clues to decide what is happening in the story. Wordless picture books invite discussion because, as you turn the pages, the story unfolds and there is plenty of opportunity for meaningful talk. Although we have read several wordless picture books together, Breakfast for Jack has been our favourite. The book is a good size for sharing one on one. The story is relatively simple and yet the illustrator has included many interesting details. It is morning, the sun is rising. Jack wakes up and stretches. Soon Boy is awake. He and Jack go downstairs. Boy feeds the black and grey cat but, each time he starts to get Jack’s breakfast, he is distracted. Poor Jack is very hungry. When my young student and I first started reading Breakfast for Jack together, she was only able to talk about small snippets of the story because of her speech delay and limited vocabulary. Now she explains that Jack is orange and white, the cat is black and grey, Boy wears purple pyjamas. We talk about the family’s breakfast of toast and cereal. We also talk about the cat enjoying a bowl of milk and then snoozing under the telephone table. Breakfast for Jack is engaging. The illustrations ensure that the reader understands exactly what is happening. The story and illustrations draw young readers in and keep those same readers involved in telling the story. Since Breakfast for Jack has become a favourite, last week I added dog finger puppets to our session. You may be aware that hand puppets and finger puppets are frequently used for play therapy because children often feel safe using a puppet to express themselves. In working with a child with a speech delay, it seems very logical to include puppets and encourage her to play with them. On Thursday, our three little dogs played together, they talked and raced at the park. Keeping in mind that my student is not only dealing with a speech delay, she is also learning English as a second language. Each week I prepare one page of vocabulary that is related to a theme. The page introdues nine words that are illustrated and related by theme. We have done ‘Weather Words,’ ‘Things Families Do,’ ‘Clothing Words,’ ‘In My Neighbourhood,’ ‘Valentine’s Day,’ etc. We review all of the vocabulary each week. As well, she reviews the vocabulary at home each week. Her progress with these words has been quite dramatic. Each week we add a new rebus poem to our program. Usually the poem is related to the vocabulary we are learning. For example, when I introduced ‘Weather Words,’ I created a rebus version of ‘Itsy Bitsy Spider.’ When I introduced ‘Things Families Do,’ we learned ‘Grandma’s Glasses.’ I like using rebus poems with young children very much. We track the text with our fingers (reinforcing that we read left to right and top to bottom). When reading rebus poems, we use picture clues to help us remember the poem / chant, we hear rhyming and we learn new vocabulary. My young student’s mom and I are thrilled with the progress she has made to date. She is an enthusiastic learner and she is happy to enjoy stories, chants and learning new words. Next week, I will write again about our session together. Grade Three Reading – What if You’ve Made it to Grade 3 and Can’t Read? Hamish is blessed with a Grandpa who reads aloud “with lots of expression”. When Hamish was little, he loved books but the love affair ends when he begins grade three reading and his teacher asks him to read aloud. Before long, Hamish is referred to a reading specialist and it is confirmed that he has been making up stories rather than reading the words on the page. After struggling with flash cards and remedial reading, Hamish decides that life will be fine – whether he learns to read or not. It takes a disastrous family road trip, an embarrassing birthday party and a persuasive older brother to change Hamish’s mind. Shortlisted for the Australian Children’s Book of the Year and the Young Australian’s Best Book Awards, I Hate Books! features relatively short chapters and very appealing illustrations. At about a grade three reading level, it is recommended for children aged seven to nine.